Hype this outfit on Lookbook! I told y'all I loved Halloween! This was my outfit for work, we all had to dress up and there was no way that I was going to pass up an opportunity to go all out. 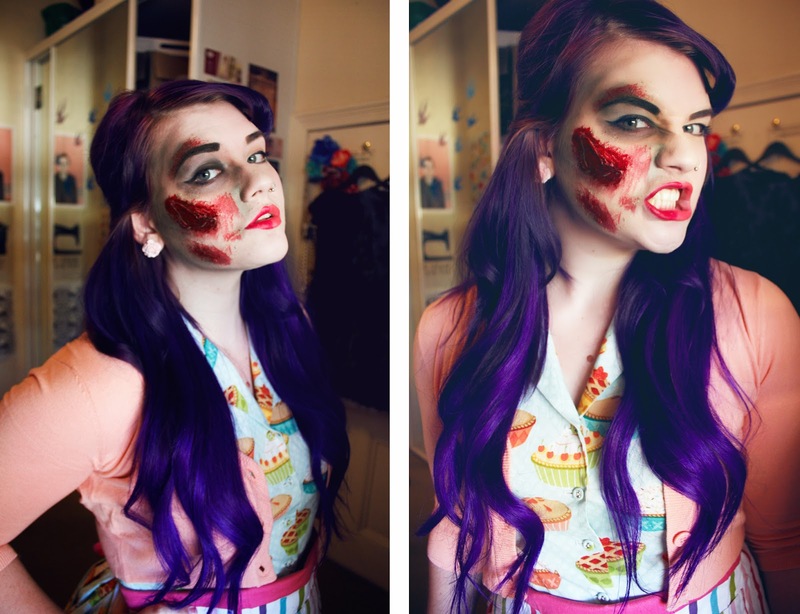 I settled on a zombie housewife costume as it was the perfect opportunity to wear my My Kind of Pie dress from Modcloth, I even made cupcakes (they were ugly though so that's why I don't have a photo, haha)! I made the wound using tissue paper and liquid latex, gave it depth with some dark brown eyeshadow and then went over it with fake blood. I kept forgetting I was wearing all of this at work and I just couldn't work out why people were looking at me so strangely - until I walked past a mirror! I have one more costume - my absolute favourite that I've worked super hard on - to share, I can't wait for you guys to see it! How was your Halloween guys? What did you all dress up as? Great costume :) I love the makeup and hair color and the overall "housewife" vibe.